Leading the project is Brandon Walker, a graduate student in the University of Wisconsin-Madison Department of Medical Physics and a researcher at the Morgridge Institute. Walker’s design aims for much faster imaging and a broader scope of application for CT.
Walker says updates to the basic machinery behind CT are long overdue, noting it is still based on 1970s technology. The clinical benefits of the faster imaging afforded by his new technology could be substantial. “Better imaging of a beating heart, for example, could lead to a greater adoption of non-invasive detection of heart disease,” says Walker. 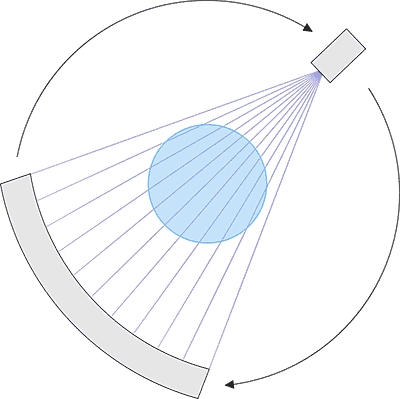 Conventional CT machines work by mounting a single x-ray source directly across from a detector on a fast-rotating circular gantry. The extremely fast rotation creates strong G forces, placing limits on imaging speeds. Conventional CT machines work by mounting a single x-ray source directly across from a detector on a rotating circular gantry. The patient lies on a platform in the center of this ring setup, and the machine takes hundreds of readings of the attenuated x-ray signal at tiny intervals as the gantry rotates around the patient. These readings are then composed to form an image of a 2D slice of the body. The quality of the image obtained is limited by the scanner’s temporal resolution, its ability to acquire all the necessary angles in the shortest amount of time possible. So how do you get past this limit on rotational speed? Walker’s answer is to eliminate the rotation altogether. In his setup, the single x-ray tube on the gantry is replaced by a large number of x-ray sources positioned around the patient in stationary modules. In place of mechanical rotation, the many x-ray sources are electronically triggered one after another in rapid succession, so that no moving parts are involved. The modular nature of Walker’s x-ray tube design makes it well suited for mobile imaging, opening up potential applications outside of medicine. Walker sees its effectiveness for parcel scanning, for example. A pair of the modules could be used as an inexpensive method of scanning luggage at airports, or for scanning packages in distribution centers. The design could also have a place in the realm of nuclear power. In Walker’s design, the single x-ray tube on the gantry is replaced by a large number of x-ray sources positioned around the patient in stationary modules. In place of rotation, the x-ray sources are electronically triggered in rapid succession. 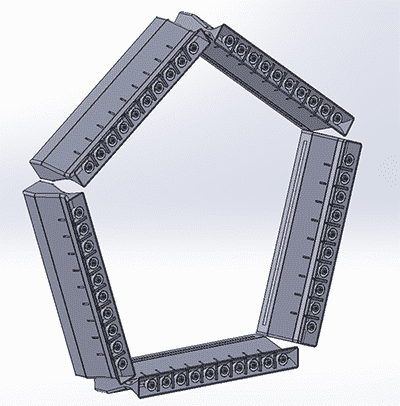 The size of conventional CT scanners make them nearly impossible to implement in nuclear reactors, but Walker’s modular design would allow x-ray tubes to be installed with relative ease. Advising Walker on the project are medical physics professors Guang Hong Chen and Thomas “Rock” Mackie, director emeritus of the Morgridge Medical Engineering team. The Wisconsin Alumni Research Foundation has filed a patent application on the advance. A proof of concept is being built at Morgridge and will be housed at the Wisconsin Institute for Medical Research (WIMR) for operation. Jeff Radtke, a nuclear instrument design engineer from the UW-Madison Medical Radiation Research Center, is working on the high voltage and coolant system for the vacuum chamber. George Petry, manager of the Morgridge Advanced Fabrication Lab, will help construct the vacuum chambers, along with engineers Robert Swader and Ben Cox. A working system is slated for the end of 2015.